← Laughter the best medicine – Stress Buster Special. 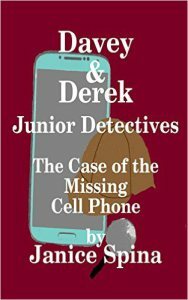 I am so excited to receive this award for Book 1 of my Davey & Derek Junior Detectives Series, The Case of the Missing Cell Phone! I am still jumping up and down with excitement! Thank you Pinnacle Awards! I am extremely honored to receive this prestigious award! To see this book go to http://Amazon.com/author/janicespina7. Also available on Barnes & Noble – http://bit.ly/1gVIsS5 and on http://www.createspace.com/5390264. This entry was posted in book award, Jemsbooks, middle-grade series, Pinnacle Book Awards, Writing, book reviews and publishing, poetry, children's books, YA and novels, Young adult and tagged book award, Davey & Derek Junior Detectives, detectives, middle-grade books, Mystery, Pinnacle Book Achievement Award, Young adult. Bookmark the permalink. 35 Responses to Pinnacle Book Achievement Award Winner! Congratulations, Janice! How exciting! We’re all celebrating with you! Congratulations Janice! so excited for you! CONGRATULATIONS! (I’m yelling). SO happy I gave that book as presents to some children for Christmas! Congratulations, Janice. I am so excited and happy for you. Still catching up on my missing days last week. Always wonderful when someone as supportive and generous as author Janice Spina​ receives an award for one of her outstanding children’s books.. fabulous Janice.